The NPD Group just released US smartphone sales figures for Q2 2012. The chart above shows that Samsung & Apple now own about 43% of US smartphone sales. 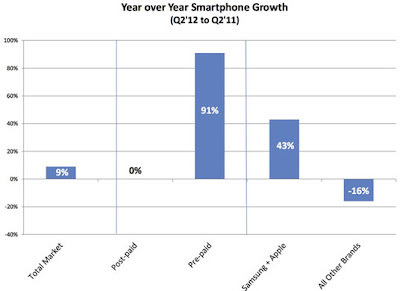 More importantly, it shows that sales of pre-paid (non-subsidized) smartphones have doubled from a year ago. This is a fairly surprising development as the US market has long been dominated by subsidized phones. This may not be great news for Apple's iPhone. Prepaid carrier Leap Wireless' latest quarterly results showed that the iPhone isn't really much of a competitor in the pre-paid market because of its high price tag. While I still expect pre-paid smartphones to form a relatively small proportion of overall smartphone sales, it may see faster growth with carriers adopting stricter upgrade policies. The iPhone's larger risk in the US market will remain the threat of reduced carrier subsidies, but Apple may also miss out on the growth of the pre-paid segment. Making better phone available on the prepaid plans would go a long way towards boosting prepaid plans. I agree. In fact one of the primary reasons behind this surge was the availability of more mid-range, pre-paid android phones. A big improvement over the models available last year.